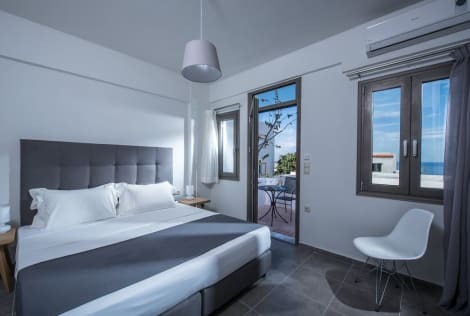 Galaxy Villas are superior high-quality villas that are peacefully situated within a pleasant complex, tranquilly located in Koutouloufari, a quaint traditional hilltop village on the island of Crete. Guests enjoy a swimming pool and a bar on-site. The villas are warmly decorated, comfortable and contemporary, featuring a light interior. They feature local architecture scattered around natural green gardens, olive trees, local plants and flowers. There is a children’s pool as well as indoor and outdoor dining area with serene views. A seasonal organic vegetable garden and picnic area where guests can taste local produce is available on site. Continental breakfast can be served on request. Galaxy Villas are located approximately 1 km from the town of Hersonissos with its beautiful beaches. 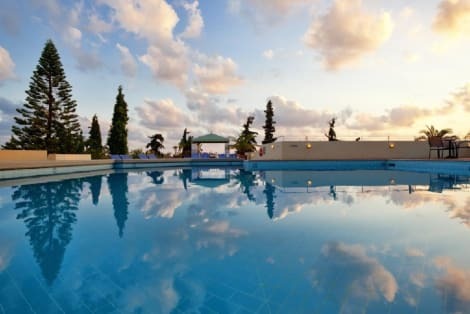 Guests are within 5 km from the Crete Golf Club and 25 km from the island’s capital Heraklion and the main airport. Dip into one of the 3 outdoor swimming pools or enjoy other recreational amenities including an outdoor tennis court and a sauna. Additional features at this hotel include complimentary wireless Internet access, an arcade/game room, and gift shops/newsstands. Located in Hersonissos, Asterias Village Resort is within a 15-minute drive of Star Beach Water Park and Crete Golf Club. This family-friendly aparthotel is 4.1 mi (6.5 km) from Stalis Beach and 0.9 mi (1.4 km) from Aquaworld Aquarium. Enjoy recreational amenities such as a seasonal outdoor pool and bicycles to rent. Additional amenities at this hotel include complimentary wireless Internet access, tour/ticket assistance, and barbecue grills. Dip into one of the 4 outdoor swimming pools or enjoy other recreational amenities including a sauna and a fitness center. Additional amenities at this hotel include complimentary wireless Internet access, a television in a common area, and tour/ticket assistance. Make yourself at home in one of the 17 guestrooms, featuring kitchenettes. Rooms have private balconies. Satellite television is provided for your entertainment. Conveniences include phones and safes. Make yourself at home in one of the 30 guestrooms. Rooms have private balconies. Satellite television is provided for your entertainment. Bathrooms with showers are provided. Nestled on a hillside, enjoying panoramic views of the enchanting Aegean sea, lies the serene village of Koutouloufari, home to this delightful hotel. Located in the center of Koutouloufari, Astra Village provides the opportunity to its guests, to enjoy the rich local culture and explore the host of dining, shopping and entertainment venues the area has to offer. This hotel's traditional Cretan exterior is blending harmoniously with the colours of the natural landscape. The guest rooms are elegantly appointed, featuring a tranquil style and aura of elegance. The rooms come complete with modern amenities, offering comfort and convenience for every type of traveller. The hotel offers a range of excellent facilities, ensuring that each and every guest enjoys a relaxing stay. Due to its hilly location it may not be suitable for the less mobile. lastminute.com has a fantastic range of hotels in Koutouloufari, with everything from cheap hotels to luxurious five star accommodation available. We like to live up to our last minute name so remember you can book any one of our excellent Koutouloufari hotels up until midnight and stay the same night.